Latest Question What is the value of that corn stover? Canola is coming off and seeding of winter wheat is upon us. While acres of winter wheat have dropped in recent years, there are good agronomic and economic reasons to include winter wheat in your crop rotation. Get your winter wheat crop off to a great start this fall by considering these seeding tips. Stubble – Winter wheat needs a good snow cover of 4 inches or more to ensure winter survival. This can be accomplished by direct seeding into tall, dense standing stubble. Stubble disturbance during harvest and seeding should be minimized to ensure that a good amount of stubble is retained for snow trapping. Weed control – It is important to control green cereal vegetation prior to seeding winter wheat to eliminate the risk of wheat streak mosaic virus. Winter wheat should not be seeded near immature spring cereals and all cereal volunteers should be controlled at least 2 weeks before seeding winter wheat. Variety selection – Yield is generally the first factor considered when choosing a winter wheat variety, but farmers should also compare varieties for agronomic factors such as standability, disease resistance, maturity, and winter hardiness. Seed Manitoba is an excellent starting place for evaluating the current and new varieties coming to the marketplace (www.seedmb.ca). Seeding date – Healthy, vigorous plants must be established before freeze-up to attain maximum cold tolerance. The goal is to have plants with a well-developed crown and about 3 leaves going into the winter. The crown is the area from which the plant regrows in the spring. Research has demonstrated that seeding during the period from late August to early September (approximately August 25 to September 10) consistently produces the best crops in terms of both yield and quality. Seeding depth – Winter wheat should be seeded less than 1” deep even when seedbeds are dry. Shallow seeding allows the seed to take advantage of fall rains, and as little as 1/3” of rain is enough to successfully establish winter wheat. *Expected seedling survival is used in its decimal form (90% = 0.9) and includes percent germination and seedling mortality. Like many carrot family weeds, spotted water hemlock populations in Manitoba have been spreading, likely due to wet conditions over the last several years. Managing populations in hayland and pasture is recommended since hemlock species are extremely poisonous to humans and livestock. Proper identification is important since spotted water hemlock looks similar to water parsnip, another carrot family weed commonly found growing in wet areas across the province. All parts of the hemlock plant are poisonous. Young leaves and re-growth after treatment may attract livestock, especially if other food sources are limited or less palatable. Access to water hemlock by livestock should be restricted while populations are being managed. Hand pulling (wear gloves!). Pulled plants can be left in the sun to dry. Once dry, plants can be disposed of in an area away from people and livestock. 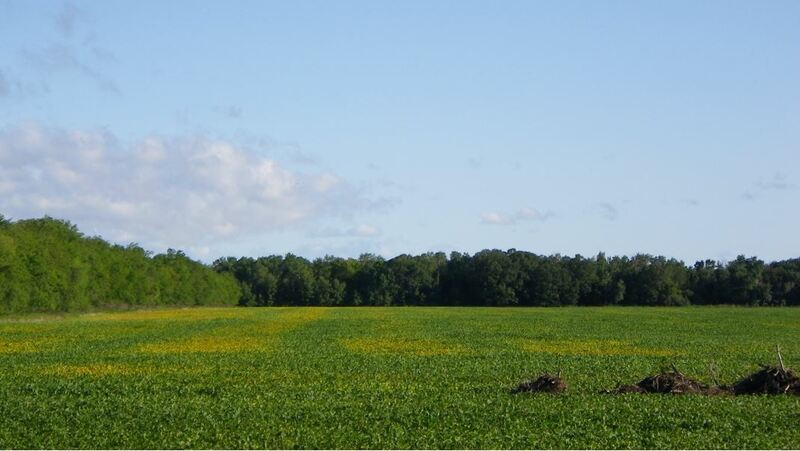 Herbicide spot treatment or foliar application. Glyphosate, 2,4-D and picloram have activity on water hemlock. Refer to the label for grazing and haying restrictions. Feeding hay with some water hemlock in it to livestock is okay, according to research from the US, as long as the hay (and hemlock) is thoroughly dried. The curing process allows the toxins in water hemlock to dissipate, reducing the risk of livestock poisoning. Hay with water hemlock should either be fed last to allow for maximum dissipation of the toxins or occasionally interspersed with hay not contaminated with water hemlock. If possible, contaminated hay should not be fed continuously to pregnant livestock, as there is evidence that chronic exposure to water hemlock toxins can result in birth defects. Unlike hay, greenfeed contaminated with water hemlock should not be fed to livestock or used for silage or baleage. Testing done in Oregon found that ensiling causes certain toxins to accumulate rather than dissipate and remain at levels that are unsafe for livestock consumption. Need help with plant identification? Pictures can be emailed to [email protected] or samples can be submitted to your local Manitoba Agriculture office (www.gov.mb.ca/agriculture/crops/crop-diagnostic-services/). When wheat prices and protein premiums/discounts are high, there is renewed grower interest in late N applications to enhance wheat protein. Following is an old recipe we have recently evaluated in on-farm-tests and small plot studies. Apply in morning or evening when temperatures are less than 20o C. Avoid heat of the day. Under such treatments we have observed leaf burn of 8-15% of the leaf area without detrimental impact on yield. The one instance sprayed at mid day in high temperatures reduced yields by 6 bu/ac with 31% leaf damage . Protein increase ranged from 0-1.5% and averages are reported in Table 1. Table 1. 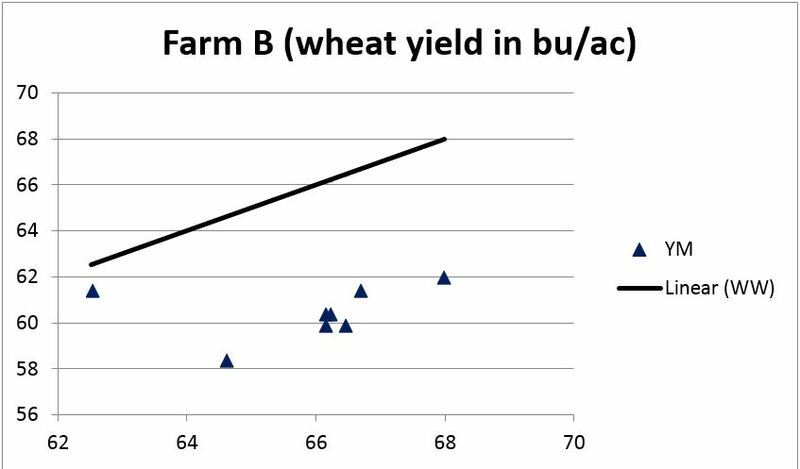 Effect of post anthesis N (PAN) on wheat class yield and protein (2015-16). In most cases, the farmer’s base rate of N was high at 150-200 lb N/ac (soil N plus fertilizer), so the extra N was not required for high protein. If attempting such a practice, leave a check strip – not so much for yield determination, but to gauge the success in protein increase. Severe winter weather can cause increased winter kill of forage stands in Manitoba. Alfalfa is prone to winterkill if the crown (the point on the plant from which all the stems grow from) is oxygen deprived due to ice cover, or if it freezes to -12 C or colder for 2-3 days. If it is decided that a stand is sufficiently compromised that renovation is needed, some factors need to be considered. Alfalfa plants produce toxins (called medicarpins in the leaves) that reduce the germination and growth of new alfalfa seedlings. Older stands have produced medicarpins longer and therefore have more of a build up or concentration in the soil around the plant where the leaves drop to in the fall of the year. Generally the medicarpins are within 16” of the crown, so reseeding or over seeding alfalfa into these areas results in limited success. Medicarpins break down over time, so a break from alfalfa for a year is sufficient time to allow for successful re-establish of alfalfa on that field. Sod or no-till seeding can be a successful way of renovating old stands so long as the above information has been considered. These are some tips for successful germination and emergence of sod seeded forages. Soil test and apply fertilizer as required, especially phosphorus (P). Suppress competition from the existing vegetation, especially under drier soil conditions. 1.5 l/acre glyphosate (480 g/l formulation) will suppress the vegetation for about 60 days. Use seeding equipment appropriate for sod seeding conditions. Packing (in furrow or land roller) will slow drying of the soil and allow seeds to imbibe water more easily. Plant shallow, i.e. ¾ inch or less. Small seeds do not have enough energy in the seed to emerge from deep plantings. Check seeding depth and packing regularly while seeding. Blackleg in Canola – to spray or not to spray? Historic levels of blackleg in that field – have you experienced yield loss from blackleg? Presence of inoculum –can you see leaf lesions on first true leaves? or pseudothecia present on canola stubble? Yield potential – what is your target yield, return on investment expected? If you have made the decision to spray, what else do you need to know? Application timing – apply at the 2 to 4 leaf stage, later applications are not as effective at reducing disease. Fungicide type – strobilurin fungicides (Group 11) are more effective at reducing disease than triazoles (Group 3). For more information on what products are registered for blackleg management, see the MB Guide to Field Crop Protection http://www.gov.mb.ca/agriculture/crops/guides-and-publications/pubs/crop-protection-guide-disease.pdf. Yield increase….not guaranteed – while strobilurin fungicides applied at the 2 to 4 leaf stage did significantly reduce the severity of the disease, yield bumps were only observed when a susceptible cultivar was grown. Reference: Liu, C. 2014. Evaluation of fungicides for management of blackleg disease on canola and QoI-fungicide resistance in Leptosphaeria maculans in Western Canada. Master of Science Thesis. University of Manitoba. 172 pp. Spruce is a common grown shelterbelt tree in Manitoba. They prefer acid soils, that are coarse textured with good drainage, have adequate water and sheltered from extreme weather conditions. If conditions are not ideal, the trees will begin to decline and become more susceptible to pests. If your trees are declining and you are considering using a fungicide/insecticide, read the label carefully to make sure the product is registered for use on the trees species and to control the pest identified. Spruce problems can be divided into three categories – Physiological, Disease and Insect. Winter burn or evergreen browning – caused by excessive water loss from the needles. In late winter/early spring, they take on a reddish brown appearance toward their branch tips and/or on one side of the tree. The south and southwest side may be worse due to more exposure to sun at potentially wind. If conditions are highly favorable for winter burn, buds can also lose moisture and be killed. Natural Needle Drop – late August or early September, coniferous trees will naturally shed their older needles (usually needles which are 3 or 4 years old or older). During this process, the innermost needles will turn to yellow or brown and drop off. Although this process takes place every year, in some years it becomes more pronounced due to environmental factors. Needle loss can appear to be very dramatic and is often mistaken for a disease or insect problem. Nothing can be done to prevent natural death of needles since they do have a finite life span. Good maintenance can minimize environmental stress. Competition Stress – if spruce are planted too close to each other, trees can suffer from competition stress. This occurs when the feeder roots from two or more trees take available water and nutrients from the same soil area resulting in slightly stronger trees taking most, while the weaker trees, deprived of water and nutrients, grow poorly and may decline and die. If the branches of two trees are in contact or intertwining, competition stress could be occurring. Branch Canker – characterized by browning and death of entire branches. Individual diseased branches can occur anywhere on the tree, although the disease may start on lower branches and move upward. White or grayish crusty or resinous patches appear at the canker site and can also occur on the trunk. Pitch may ooze from these cankers and drip onto lower branches. During wet weather, some cankers can produce spores that disseminate to cause new infections. Pruning out areas affected is the only means of control once the disease has been initiated. Prune when the weather is dry, with pruning tools sterilized between cuts with alcohol (isopropyl alcohol), or a household disinfectant such as Pinesol or Lysol and all diseased material should be removed or destroyed. Needle Cast – characterised by irregular tan, yellow, red-orange, reddish brown or black spots, specks or bands being produced on the needles from previous seasons of growth. The fungi can infect the new growth from the current season, but do not usually show symptoms on those needles until the following season. Affected needles generally drop early. Twigs of infected trees may appear stunted and may dieback. To prevent spreading, the new needles should be protected by applying a copper fungicide containing copper oxychloride just as growth begins in spring. Repeat applications 3 or 4 times at 10 day intervals. If the planting is not too large, it would be helpful to rake up and remove fallen needles from under the trees to remove them as a source of reinfection. There are currently no fungicides available for home use but fungicides with commercial or agricultural registration are available. Consult with an arborist or tree care service for fungicide options. Spider Mites – all evergreen trees have a resident population, but during hot dry spells populations can explode. Visual symptoms start as dingy yellow or dusty needles and progress to brown and dry, then needles drop. There may also be a fine webbing, between the needles. In severe or prolonged infestations, dust particles, shed needles and dead mites catch in the webbing giving the tree an unhealthy appearance. Damage to the tree is caused by both adults and nymphs sucking sap from the needles. Mites can be controlled by using any insecticide listing mites and spruce on the label, at a rate recommended on the label. Dormant oil sprays can also be used to control spider mites. See directions for use on the labels. Spruce Needle Miner – webbing is produced and may contain dead needles and frass (droppings). Damage is done after tiny larvae hatch from eggs that have been laid along the sides of a needle and begin to chew a hole at the base of it. The insects feed on the needles and exit from the same hole in search of new needles. Full-grown larvae are green with a brown head and are about 6 mm long. The larvae remain active until October when they construct a cocoon inside a nest of dead needles and frass to overwinter. Adults emerge as small greyish brown moths that have a 12 mm wingspan. If a tree has a large number of needle miner nests it can appear quite unsightly, as airborne material such as dust and poplar cotton become easily caught in them. Heavy infestations can severely weaken the tree through loss of needles. Before bud break in spring, the nests can be washed away with a strong stream of water from a garden hose. The debris should then be gathered and destroyed. This may help to reduce the current year’s infestation. White Pine Needle Scale – evident by tiny white flecks on the needles that resemble spots of paint. Each white scale contains a dead body of a female scale insect and her overwintering eggs. During the summer the crawlers moult to become adults after which they begin to secrete a white scale covering. Scale insect feeding damage causes large yellow areas on the needles that can coalesce if the population density becomes excessively high. Sustained heavy attack for 2 or more years can cause trees to lose most of their needles. Insecticides or dormant oil sprays listing spruce and scale insects on the label can be used for control. Follow label directions. White Pine Weevils – weevils kill the top 2-3 years growth of their host trees. Damage very conspicuous, causing the terminal leader (very top of the tree) to wilt and take on a crook shape, turn brown and die. Located below the damaged area, there can be found small exit holes made by the emerging adult weevils. Adult weevils overwinter in the litter on the ground. There are no insecticides registered for control. Prune and burn infested leaders before mid-July to remove and kill the insects. Cut back all but one live lateral (side) shoot by at least half their lengths to maintain single-stem dominance. Avoid planting the highly susceptible Colorado blue spruce in areas where white pine weevils have previously caused damage. Spruce Bud Scale – heavy infestations can result in twig and branch dieback. The presence of sooty mold on twigs, needles and branches may be the first clue to the presence of the insect. The sooty mold does not cause any damage to the tree but is unsightly and since it is highly visible is often mistaken for the cause of needle and twig dieback if these are occurring in association with the scale infestation. The female adult scales cluster along the stems of twigs. They closely resemble the buds of the spruce tree, lower branches on the trees are often the most heavily infested. Heavy scale infestations result in discoloration and loss of needles, twig dieback, dieback of lower branches and reduced tree vigour and growth. Infested trees are also reported to be more susceptible to winter injury. Any insecticide listing spruce and scale insects on the label can be applied to reduce damage from this insect. Follow label directions. Insecticides should be applied while the crawlers are still active. A reminder that if seedbeds turn dry, the safety margin shrinks when applying seed placed fertilizer. Seedburn can result from ammonia toxicity and/or salt content of fertilizers. For nitrogen, our Soil Fertility Guide provided safe guidelines for seed placed urea on cereals and canola across a range of soil types and seed-fertilizer configurations. With the increased popularity of narrow seed and fertilizer spreads with disk drills, the safe rates are reduced. For example, safe urea rates for cereals vary from 10 to 25 lb N/ac going from sand to clay soil using disk openers on 6” row spacing. These guidelines are for moist soil and should be reduced by 50% if seedbed moisture is lower when weather is hot and windy. The safe rates of seed placed phosphorus depends on the crop, with cereals being quite tolerant compared to soybeans, dry beans and canola. With a disk drill as described above, cereals can tolerate 50 to 60 lb P2O5/ac as mono ammonium phosphate while rates would be 20 lbs/ac for canola and less for beans. If there greater seedbed utilization (i.e. narrower rows or a wider seedrow with less fertilizer concentration) rates could be more liberal. With the wet conditions and delayed harvest experienced in parts of Manitoba in fall 2016, very few farmers were able to complete their fall fertilization program. Since early seeding is important for optimizing crop yield, producers will be looking for ways to apply their N requirements efficiently without delaying the seeding operation. In addition, soil reserves of N are variable and margins between crop revenue and input costs are modest; therefore, optimizing nitrogen fertilizer use efficiency is important. To achieve these objectives for a spring fertilization program will require use of a 4R nutrient stewardship strategy: applying the right rate of the right fertilizer source, with the right placement and at the right time to minimize losses of fertilizer N to the environment and optimize the crop’s access to the fertilizer. The following link provides highlights from some of the presentations most pertinent to agronomists and farmers in Manitoba. Please contact me for further information on these presentations or meetings. Due to there being concurrent sessions at these meetings, there were many more presentations than what is presented in this summary. These were selected because of their relevance or potential interest to those working in agriculture in Manitoba. I have categorized the presentation reported by commodity group or discipline. The information presented is a combination of material from oral presentations, poster presentations and provided as abstracts for the various symposiums. Many presentations have multiple authors, however only the presenting author is reported in this summary. Over the past three winters, Manitoba Agriculture through the AgWeather Program has been measuring soil temperatures real-time in winter wheat fields. The monitoring of soil temperatures can provide an early indication if there is a concern for winter injury or winterkill. The earlier a problem is identified or suspected, we are able to provide that information to industry so careful assessment of acres occurs in the spring. In the coming weeks, the data will also be made available to Western Ag for their Winter Cereal Survival Model, available at the following link: http://www.wheatworkers.ca/FowlerSite/winter_cereals/WWModel.php. I would highly recommend taking the time to read instructions on how to use the site and interpret the results. Click here for instructions on how to use the model. When Should I Swath My Canola? Staging canola for swathing or pre-harvest desiccation is critical to maintain high quality seed and maintain yield. Ideal swath timing is when 60% of seeds on the main stem have turned colour, meaning 60% of all the main stem seeds are showing some form of colour (yellow, brown, black) other than green. For 60% seed colour change, the bottom third of the main stem of the plant will have totally brown/black to purplish seeds, the middle third will have turned, or be showing some spots of colour, and the top third are green. The green seeds must be firm and should roll between your fingers without squishing. At this stage, the average moisture content is about 30%. Producers are reminded that more than one area in a field will need to be assessed for seed colour change. Relying on a visual assessment of canola pod colour alone will not provide an accurate estimate of crop stage. In many cases, the outside of the pod colour can turn brownish yellow but seeds inside may still be green. Earlier swathing tends to lock in green chlorophyll in underdeveloped seeds, reducing oil content and potentially causing marketing issues. Canola can be swathed in the 30-40% seed colour change stage to manage a large number of acres ripening at the same time, but producers should be aware that swathing at this stage can cause yield losses up to 8%. Dry growing conditions and damaging weather have impacted canola development across Manitoba in 2018. Evaluating canola fields for evenness and uniformity is important to selecting the right time to swath or desiccate the crop. If growth conditions allowed large patches of delayed emergence, or hail set back crop development, estimating the patch size and managing the crop according to the largest percentage area is a good recommended practice. Glyphosate, Heat and Diquat herbicides are all registered for use as either a pre-harvest aid or a desiccant on canola. Check the labels or the Guide to Crop Protection (https://www.gov.mb.ca/agriculture/crops/guides-and-publications/#gfcp) to know their specific use. In general, a pre-harvest aid (glyphosate and Heat LQ) should be used to increase plant tissue drydown and kill green weeds. The correct stage is 60-75% seed colour change. Expect to harvest the crop 1-3 weeks after spraying, similar to the time expected between swathing and harvesting. A desiccant with the active ingredient diquat works more quickly, forcing removal of crop moisture. A fast-acting product, expect to harvest 4-7 days after application. Target a minimum of 90% seed colour change, as diquat will lock in any remaining green chlorophyll in the seed. Caution is advised when swathing or desiccating a canola crop, since that is considered growth and development termination, according to pre-harvest interval (PHI) standards. Know the length in days PHI of the fungicide and/or insecticide used on the crop; swathing or desiccating should not take place before that PHI window closes. Rust in sunflower is caused by the fungus Puccinia helianthi, which overwinters on plant stubble and produces five spore‐stages throughout the year. Early in the season, orange rust pustules appear on the upper surfaces of cotyledons of seedlings and volunteer plants, with later infections moving to the underside of the leaf (Figure 1). The most yield-damaging stage occurs in late July to early August, when symptoms of infection show up as dusty, dark brown pustules on leaf surfaces, petioles and flower bracts (Figure 2). As the disease develops, black teliospores form, overwintering on the crop residue. Sunflower rust becomes a more severe issue in later-planted crops, or crops with weaker genetic resistance. Warm, moist weather favours rapid multiplication of rust spores, and windblown spores can travel quickly from field to field. Early stages of sunflower rust in 2018 have been observed in the Cypress River area the week of July 3rd. High plant populations and dense, leafy canopies allow humid conditions to remain in the crop throughout the day, compounding injury from rust spores. Scout sunflower fields regularly to monitor the development and stage of rust infection. Watch for dense clusters of brown, powdery pustules scattered over all plant surfaces. Orange-brown ‘dust’ on clothing after being in a sunflower field is a key indicator that rust is present, and more careful scouting is needed. Withered lower leaves are an indication that the surface is heavily infected. Controlling rust after infection is primarily done using triazole-based and strobilurin-based fungicides. 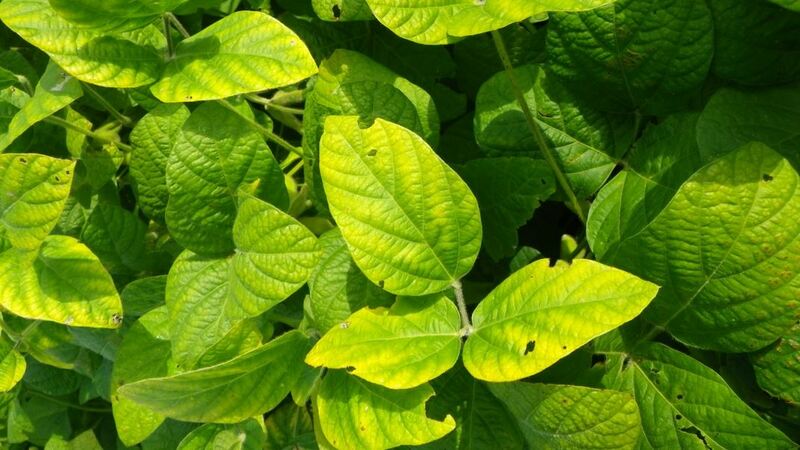 Recommended action in rust-infected crops is to use a fungicide from the triazole group after the first onset of symptoms, at the 2-3% pustule coverage on the upper four leaves at flowering (R5). Strobilurin-based fungicides act more as a ‘protectant’, applied earlier before widespread infection occurs. Is it Time to Make Wheat Protein? Wheat growers are nearing decision time on whether to supplement their wheat crop with nitrogen for protein enhancement. 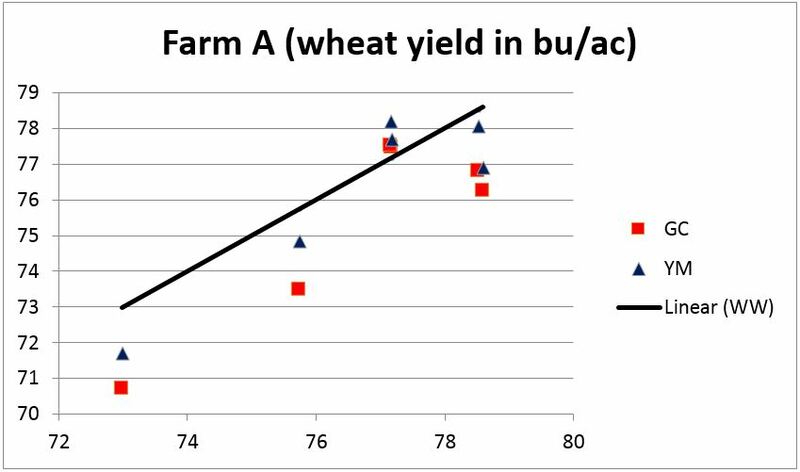 Currently it is suggested that if the yield potential of the wheat crop looks good, and higher than for the N rate initially supplied (i.e. at 2 lb N soil and fertilizer per bu), consider trying a treatment. And check with your marketing consultant whether market signals suggest a shortage of high protein wheat being harvested elsewhere.